Storage requirements for chloropicrin outlined by US Chemical Storage. Chloropicrin, commonly known as PS, is a chemical compound used as a fungicide, herbicide, insecticide and nematicide. This colorless liquid is heavily used in the agricultural industry, where the liquid is injected into the soil, prior to planting a crop, to clean the soil from fungi, microbes, insects and other elements. The chemical has also been used as a chemical warfare and a riot control agent; holding similar characteristics to tear gas. However, chloropicrin is no longer authorized for military use. Chloropicrin is available only to licensed professionals and agriculture specialists and is regulated by the United States Environmental Protection Agency. According to the Center for Disease Control and Prevention, “First Responders should use a NIOSH-certified Chemical, Biological, Radiological, Nuclear (CBRN) Self Contained Breathing Apparatus (SCBA) with a Level A protective suit when entering an area with an unknown contaminant or when entering an area where the concentration of the contaminant is unknown. Level A protection should be used until monitoring results confirm the contaminant and the concentration of the contaminant”. In high concentrations and unregulated settings, chloropicrin can be harmful to humans. The chemical can be absorbed systemically through inhalation, ingestion and the skin – and can be severely irritating to the lungs, eyes and skin tissue. If inhaled move person to fresh air. If the chemical is found on clothing or skin, immediately remove clothing or any other items on skin. Rinse skin immediately with water for 15-20 minutes. Eyes: Rinse eyes gently with water for 15-20 minutes. Contact your local poison control center or doctor for further treatment advice. If the chemical is swallowed, call your local poison control center or doctor for further treatment. 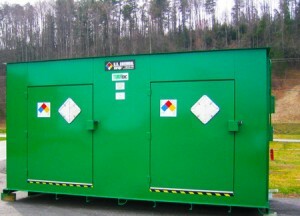 Store chemical containers upright in a cool, dry and well-ventilated storage building. Ensure that the chemical is stored in its original container. Proper storage requirements for chloropicrin are advised to maintain a safe and hazardous free work environment. The colorless liquid poses explosion hazards under specific circumstances. To ensure proper storage requirements for chloropicrin, keep Material Safety Data Sheets (MSDS) on hand, at all times. If a spill occurs evacuate the area immediately. If entry is necessary to the affected area, use a self-contained breathing apparatus (SCBA) to correct the problem. Move leaking containers outdoors to be placed onto spill berms or spill containment pallets. When disposing of chemical drums allow empty containers to aerate with the cap off by using mechanical ventilation, inside your chemical storage building, or use fume extraction with a snorkel hose. Visit us online or call 888-294-2729 for a free chemical storage consultation or to learn more about chemical storage requirements regarding your chemical storage building.